I put up a couple of videos on my “Willow Slough DX” YouTube channel nine hours ago that may rate at least an Arte Johnson (Laugh-in) “verrry interestink”. These are two videos of the North Korean shortwave station Voice of Korea operating with their new time zone and on their new schedule. These are the two most recent videos of SW station receptions that I have posted during the last couple of days. Thanks for sharing this, Dan! It never crossed my mind that VOK would change their international broadcast time based on the fact they shifted their country’s time zone. From a North Korean perspective, though, I suppose this makes sense. Thanks for the tip! Click here to check out other recordings on Dan’s YouTube Channel. This entry was posted in Broadcasters, International Broadcasting, New Products, Shortwave Radio, Videos and tagged Daniel Hawkins, DPRK, North Korea, Sangean ATS-909X, Voice of Korea, Voice of Korea Schedule on May 6, 2018 by Thomas. Many thanks to SWLing Post contributor, Direwolf131, who recently commented on one of the Sangean ATS-909X reviews in the Post archives. I’m a few years after Steve’s comments but I will have a go at it, at least anecdotally speaking. I’ve owned a half dozen Sangean ATS-909’s, which includes two of the 909X’s, and one super-909 from radiolabs. The 909X is the finest looking portable I have ever seen or lain hands upon, and that includes several Sony’s that I still think of as neat looking, I had the white cabinet 909X first and then the much more striking (to my eyes) black cabinet 909X after returning the first one due to rock hard buttons. They are both extremely attractive, and exceptionally well made, especially by today’s cheap Chinese standards. I must confess that I also still find the original 909’s almost equally neat looking, though not quite sporting the same robustness of build. The 909x’s sound wonderful on MW & FM, and its a decent performer reaching out to fairly distant FM stations. Unfortunately that is largely the best of the radio, its performance on MW & SW is best described as pathetic, and not just due to being deaf, it has a lot of noise, even when attached to the superb RF systems tuned EMF antenna. The older 909 is also to my experience substantially better then the 909X when matched up to a serious outboard antenna, such as the above EMF, I found this difference especially surprising, its not even close. The PL-880 from Tecsun blows it away on SW and MW sensitivity, while also offering the superb advantage of genuinely ECSS tuning anything on MW & SW, you cannot decently receive any MW or SW signal via ECSS with the 909X as its SSB can only be fine tuned to 40 Hz, which is terribly disappointing, you can zero beat the little Tecsun easily. serious ECSS capability is to my mind a much more attractive option then a sync circuit, and unfortunately with the beautiful little Sangean 909X you get neither. I do hope anyone who happens upon this pays attention, because for the money the PL-880 is far and away the better performer, in fact my little 1103 from Degen/Kaito out performs the 909X, as does my Grundig Yacht Boy-400, and my Sangean ATS-803A. Its my great hope that Sangean seriously upgrades these deficiencies in the otherwise gorgeous 909X, its circuitry is noisier than the old 909 and its not nearly not as sterling a performer hooked up to household current and a decent outboard antenna as the old 909, its 40 hz tuning SSB once a great reason to buy a 909, is no longer competitive, especially against the superb PL-880 which again is capable of excellent ECSS even by Icom R75 standards, Sangean would do well to drastically improve the SSB performance of the 909X. I hope this helps, I liked the original review up top, but again its several years old, and the ATS-909X is now known to be clearly outclassed by the more affordable Tecsun, actually by the PL-660 to boot, I really hope Sangean addresses the issues, its such a beautiful receiver, you just want it to be as good as it looks, unfortunately it’s not! Thank you for sharing your evaluation and comments! The Sangean ATS-909X is an interesting radio indeed. Almost everyone loves the design, audio and overall quality of the 909X. Yet performance reviews are somewhat polarizing: some 909X owners claim the 909X has strong performance characteristics on shortwave, while others believe it’s almost deaf. Your findings coincide with mine from the Mega Review where I pitted the ATS-909X against the Tecsun PL-880, PL-660 and Sony ICF-SW7600GR. In that review, where I relied on a whip antenna, the 909X was noticeably less sensitive than the other three competitors. Based on the premium one pays for the 909X, I was surprised. I have learned over the years, however, that the 909X can handle larger outdoor antennas and doesn’t easily overload. Additionally, the 909X requires a fresh set of batteries for optimal performance/sensitivity. Some users have even modified the radio with a 4:1 impedance transformer–click here to read a post/comments about this mod. I would love to see Sangean produce an updated/upgraded version of the 909X, but at this point I’m not exactly holding my breath. I’ve heard that they’re slowly pulling out of the market. 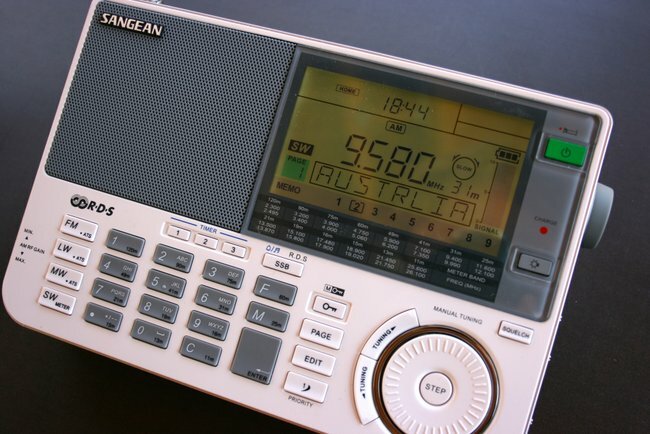 Hope I’m proven wrong because I’d love to see a new shortwave set from Sangean. 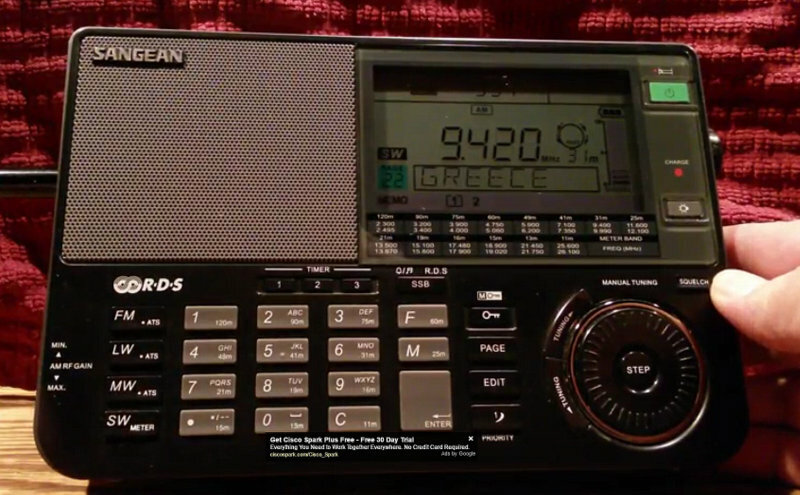 This entry was posted in News, Radios, Reviews, Shortwave Radio, Shortwave Radio Reviews and tagged ATS-909X, Direwolf131, PL-880, Sangean, Sangean ATS-909X, Sangean ATS-909X Review, Tecsun, Tecsun PL-880 on April 6, 2018 by Thomas. I recently purchased a Sangean ATS-909X and while I really like the radio, I wasn’t too impressed with the envelope pouch/case it came with for protecting the radio. I really like the leather case of the Tecsun PL-880 but it appears to have one major flaw, it only holds the radio and no accessories. I like to have everything all in one neat kit. So, I set out to see what I could find that would fit my 909X. It didn’t take me long to find this little gem [on Amazon.com]. By removing the CD envelope inserts (they’re just sewn in) there’s just enough room for the radio, power transformer, earbuds and reel antenna. I’ve attached a couple photos to show the case and what fits inside. I added a little strip of soft green foam I had around the house to take up some of the extra space around the radio while also providing a little more protection. While the case is only faux leather it is very sharp looking, black with white stitching, and is a big improvement over the supplied case, particularly since everything I need is in one complete package. By the way, I read on the SWLing Post a tip from you regarding the need to use fresh batteries to boost the sensitivity of this radio and you could not be more correct. In fact, using the AC adapter is almost a must for pulling in weak signals. And as others have said, an external antenna really helps but for me I’ve found that running on AC power makes the biggest improvement in performance. Many thanks for sharing your tip, Gregg! That’s a stylish case! I imagine there are many readers out there who even have CD/DVD cases they no longer use for storage and could be put into service as a radio case. This entry was posted in Accessories, News, Shortwave Radio and tagged ATS-909X, Cases, Gregg Freeby, Sangean ATS-909X, Shortwave Radio Cases on February 6, 2018 by Thomas. Updated version of the Sangean ATS-909X? I had read with interest a review on Amazon about a purchaser receiving a Sangean ATS-909X in black with the firmware listed as “P-01”. I can confirm that this is indeed the case and that I am curious as to whether there is more than just a simple firmware revision. Brief history with my unit: I originally purchased one new (only available in white in Australia factory backed ) in August. The packaging was as I remembered from years ago and the firmware was 1.29. After a few happy months of use sans batteries I decided to slot in some Eneloops . First charge nearly cooked the batteries then the unit refused to charge at all. Back to the retailer. A few days before Christmas I got a call that a replacement was sent from the distributor and promptly trained it over to pick it up. First impression is the box is now all white with the new look Sangean logo. This unit is also set for extended FM (76-108 MHz) whereas the old unit started at 87.5MHz. Upon switching on, firmware check showed “P-01”. The biggest disappointment for me is the backlight. The old unit backlight had a beautiful even light blue colour across the LCD panel. The new one has a distinctly darker browny tinge on the left and bright bluish rings of light where the LEDs are on the right. I think whatever was behind the LCD display that gave it the uniform light has been removed or moved. I know I used to be able to see some sort of ribbon cable just behind the Page and mode region on the LCD which the new unit does not have. That or quality is an issue…. My partner can’t see any issue with the display but then she is well aware that I am picky. Mediumwave reception appears to be much better on the new unit, however I do note one static hash frequency at 885 kHz. Seems very narrow and doesn’t affect reception for me. I note the bandwidth is very wide. Even 8/10 stations have a distinct hiss. Nothing major and music clarity is very good because of this but DXing in wide mode can get tiring. 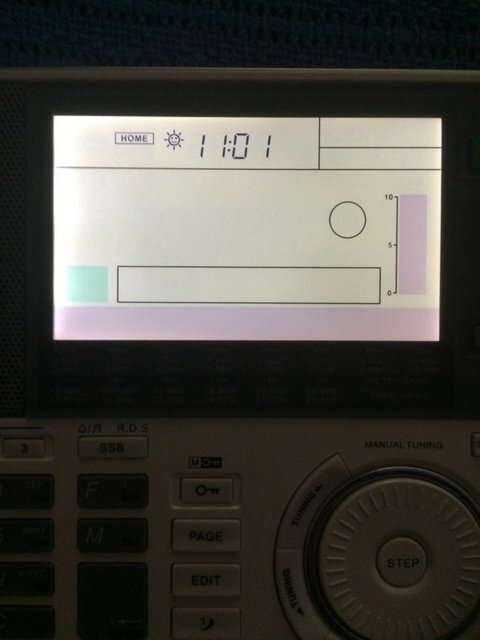 [After] listening to MW for about an hour, the unit drifts about 1kHz down (in 30 deg C heat). During normal operation, you don’t notice it–however, when trying ECSS using SSB it will vary from cold at nearly dead on frequency to dropping to the top cusp of the next lowest kHz when hot. It may be that the old unit was the same but was calibrated slightly higher hence it never dropped a kHz on the display when hot. LW is of no use in Australia however the new unit does have weak MW images, something I did not note on the old unit. Aircraft NDBs are all there. SSB. Hmmm. There is a problem as others have noted. First there is quite prominent drift due to heat. The old unit was rock solid and had very, very good ECSS capabilities. The new does appear to be very picky but it is still usable. I think the techs forgot to set the DSP bandwidth to narrow in SSB mode. It seems extremely wide. There is no tune muting though (in any mode) when using the wheel but a careful–finger is needed to get close to zero beat. Shortwave is hash for me as I live in units where people seem to buy cheap LED RF spewing globes. Ugh. It seems the same as the old unit. It needs AC to get maximum sensitivity. Go battery and there is a definite deafness. FM is superb. Only difference to the old unit is the stereo decode threshold. The old unit would decode stereo well before RDS. This new unit requires at least 7/10 before decoding stereo. Some fringe stations will get RDS info without ever getting stereo decode. No biggie, [especially since] unit only has one speaker. I am thinking that the DSP chip has changed on P-01 units as the slight differences in operation and look behind the LCD panel makes me think some re-engineering has been done to the circuit board perhaps to accommodate chip changes. Thank you for your evaluation of the “P-01” version of the venerable Sangean ATS-909X, Avo. Post readers: have you also noticed performance differences between legacy and current production ATS-909X models? This entry was posted in New Products, News, Portable Radio, Radios, Shortwave Radio and tagged Avo Ohanian, Sangean ATS-909X, Sangean ATS-909X P-01, Sangean ATS-909X Review on January 3, 2017 by Thomas. Many thanks to SWLing Post contributor, DanH, who shares the following feedback. Note that he sent this to me about two weeks ago, but my life has been so busy the past few weeks, I’m still catching up on email. Thanks to everyone for understanding! We all know how hard it is to get good SW reception without a decent antenna at this point in the 11-year solar cycle. But, the past couple of days have offered good propagation conditions for reception here in Northern California. Here is a video I made this evening during the 8:00 p.m. hour, 10-11-2016 PDT (0300 hour, 10-12-2016 UTC). It isn’t all that bad. Here are five stations in under two minutes (but really, WWV doesn’t count). There is plenty to listen to. Voice of Greece is in the Greek language with great music. The other stations are broadcast in the English language. Thank you for sharing, Dan! Wow–RNZI is quite a strong catch at your location! It’s so nice when conditions improve and that elusive DX pops out of the niose. At this point in the solar cycle, we just take what we can get! Only last night, I was amazed with the Voice of Greece here on the east coast. Even as propagation conditions deteriorated, VOG held on at S9 +20db via my Elecraft KX3. This entry was posted in News, Radios, Shortwave Radio, What's On Shortwave and tagged DanH, Sangean ATS-909X, shortwave, Videos on October 23, 2016 by Thomas.